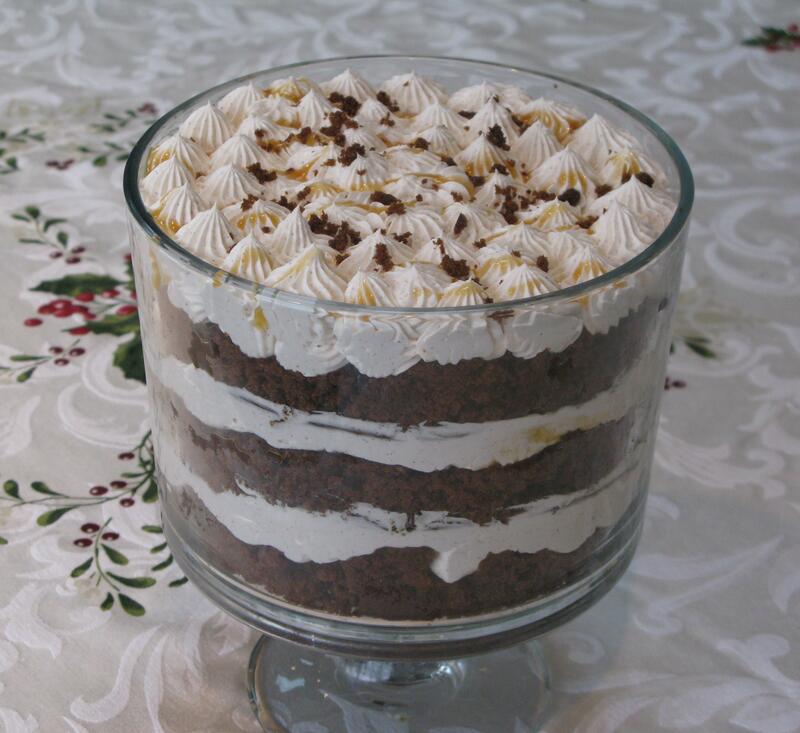 Tis the season for trifles…and gingerbread! What better way to celebrate the holidays by combining these two gems together? Exactly my thoughts as well. After making the upside down apple gingerbread cake, I decided to utilize it in a trifle recipe. My husband and I were just discussing last night how neither one of us really grew up eating gingerbread type desserts. Last year when I made the soft gingerbread cookies for the first time, I fell hard for them. Such a warm flavor all rolled in with the moist yumminess of it all. After making one round of this trifle experimentation, I decided to change a couple of things about the recipe. Originally, I had double the amount of cream cheese, and only 16 oz. of cool whip. After using my family as guinea pigs, we all agreed that it needed more of a creamy texture. So, in place of the extra 8 ounces of cream cheese, I changed it to an extra amount of cool whip. The caramel sauce added even more moisture to the cake, along with some added flavor. Preheat oven to 350 degrees. In a large bowl, cream together the sugar and butter. Beat in the egg, and mix in the molasses. In another bowl, sift together the flour, baking soda, salt, cinnamon, ginger, and nutmeg. Blend into the creamed mixture. Stir in the hot water, pour into greased 9×13 inch cake pan. Bake for 35-40 minutes in oven, or until a knife inserted in the center comes out clean and cake is slightly pulling away from edges of pan. Cool for 10-15 minutes in pan before turning out onto cooling rack to cool completely before putting together in trifle dish. Divide gingerbread cake into three sections, reserving a very small amount of crumbs for topping. In large bowl using electric mixer, beat cream cheese, powdered sugar, and cinnamon until well blended. Gradually add cool whip, continue mixing until smooth. Crumble first section into a trifle bowl, then drizzle with 1/3 cup caramel sauce. Spoon 1/3 of cream cheese and cool whip mixture on top of cake and caramel sauce. Repeat layering two more times, then top with a small amount of cream cheese/cool whip mixture, gingerbread cake crumbs, and drizzle with a little bit of caramel sauce. Place in refrigerator for a minimum of 4 hours or overnight, store in refrigerator.